I did this piece a while back but I'm still pretty attached to it. You can imagine why, since it has all of my favorite obsessions wrapped up into one package. Naturally, the things you feel passionately about always inspire more intriguing works of art. 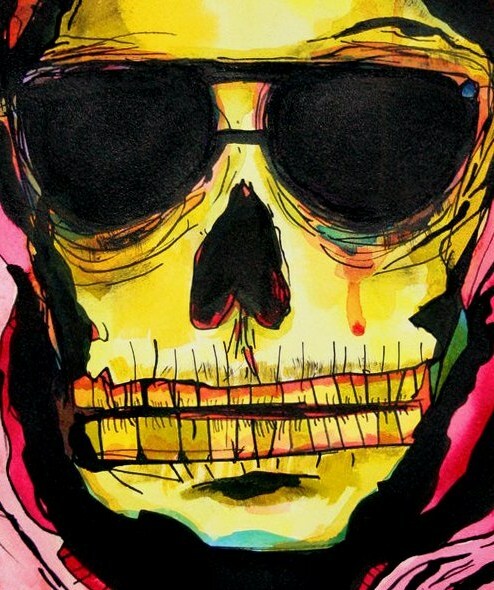 For me, was skeletons, sunglasses, and Ralph Steadman. 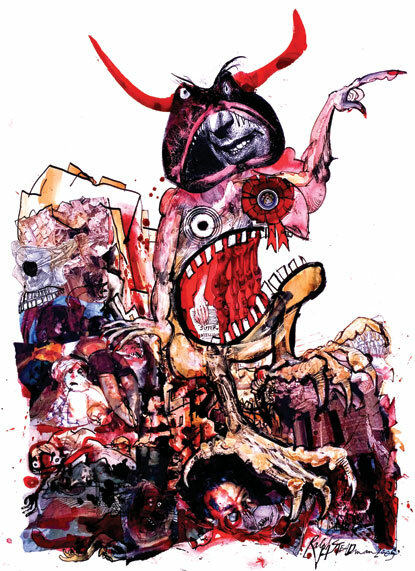 If you haven't heard of this guy before, he's an incredible political cartoonist that did most of the illustrations for Hunter S Thompson. He was called to my attention when I watched Fear and Loathing in Las Vegas on DVD. On the menu screen it shows a clip of him scrawling out the title of the movie with pen and ink. He's completely mastered the skill of haphazardly slinging ink everywhere. After seeing this video, I had to try it for myself. 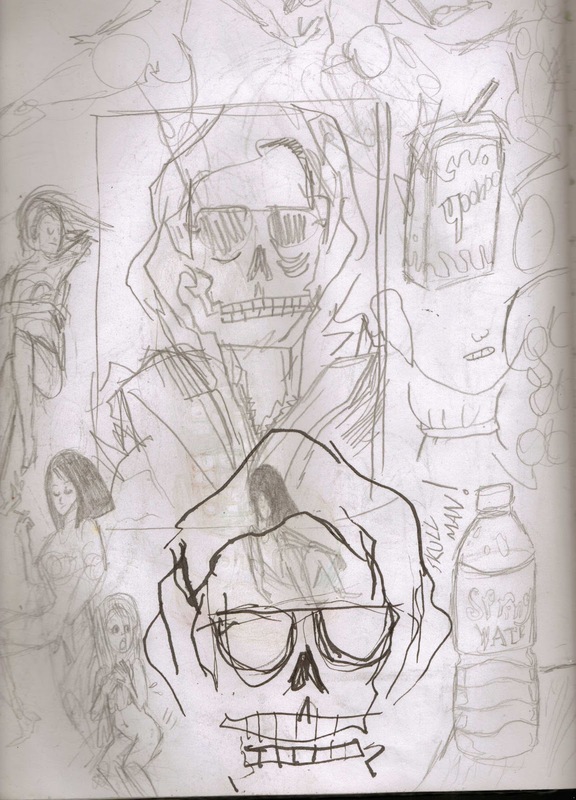 Concept sketches surrounded by doodles. "There's a saying: 'In art there is no such thing as a mistake -- a mistake is an excuse to do something else. That's how I feel about drawing and writing. I couldn't draw very well. I kept blotting things by accident, so I decided to make mistakes part of my work." Some artists (especially me) always strive for perfection in their work. Tiny stray lines, smeared colors, a crinkle in the paper spells failure in the eyes of some. But who's to say that these mistakes cant be embraced? After many projects where I tried to be perfect, this idea was exciting to me. 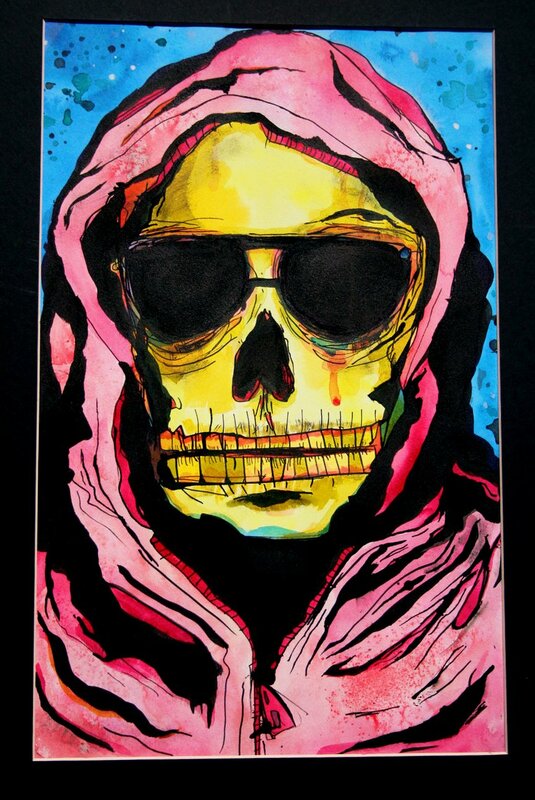 I allowed myself to make mistakes as I carved out the Skeleton Man in ink. It was very freeing. And of course, you can't really pinpoint any of the areas I messed up, can you? 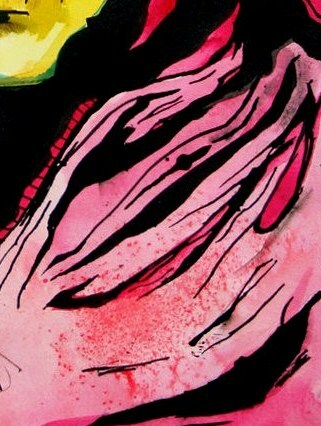 Another cool trick I experimented with in this work was using table salt on the wet inks. Allowing salt to dry on newly applied paint will absorb some of the moisture and pigment, leaving a beautifully speckled design on your piece. For my skeleton man, I think it's the specks that really bring the whole piece together. It gives an extra sense of color and textured in areas that otherwise would've been plain. Since this piece was featured in a local art show, it's already professionally matted and ready to hang. If you're interested in buying the original, contact me for a negotiation of price. 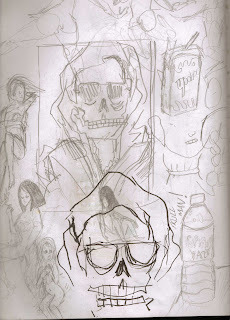 By the way, Skeleton Man returns in my other infamous piece, Death's Designer Shoes. I can't get enough of this kid.